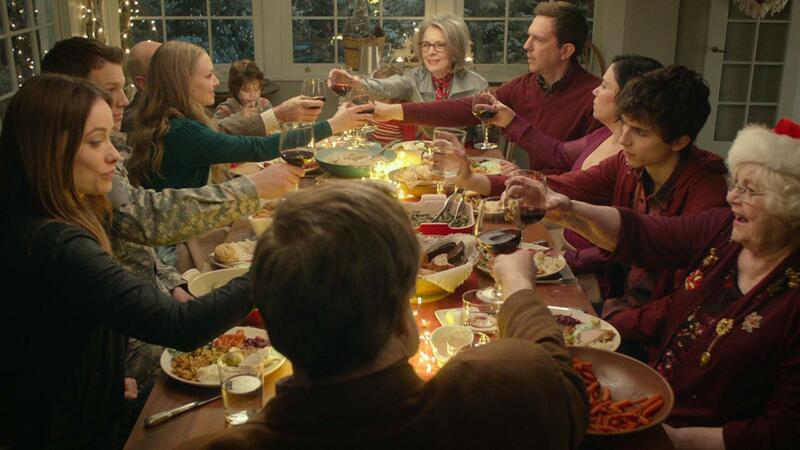 Nothing says the holiday's like the perennial Christmas movie with it's multi character cliche stories all coming together for that feel good ending. Directed by Jessie Nelson who did Corrina, Corrina and I Am Sam from a script by Steven Rogers who did P.S. I Love You and Kate & Leopold, Love the Coopers is from the Christmas card sent by the Cooper family during the holidays. 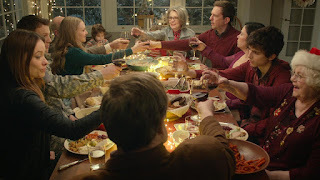 The tale bounces around from the perspective of the unknown narrator voiced by Steve Martin relaying the story about older parents having their annual get together with their adult children and their kids. It's not as quirky and as funny as Love Actually which should be yearly required viewing during the holiday season. Diane Keaton and John Goodman play Charlotte and Sam Cooper. They have been married for 40 odd years, and are planning to announce to the family they are separating. The last straw was Charlotte's unwillingness to go on a trip with Sam. They still do things together like singing carols at the old folks home where Sam's slightly addled Aunt Fishy (June Squibb) lives. They take her and their granddaughter Madison (Blake Baumgartner) around the town doing shopping and visiting Santa. We also meet Madison's father Hank (Ed Helms) who lost his job taking family photo's at Sears and his son's Charlie (Timothée Chalamet) and younger brother Bo (Maxwell Simkins). Hank is separated from his wife Angie (Alex Borstein) and is stuck looking for work. Bucky (Alan Arkin), Charlotte's father. is smitten by diner waitress Ruby (Amanda Seyfried) who breaks his heart when she decides to quit her job. Eleanor (Olivia Wilde) cute meets a soldier at the airport who is stuck from travelling home for the holiday's due to the bad weather. She is trying to kill time before she goes to her house avoiding the “antisappointment” she feels her parents will have with her. She asks soldier Joe (Jack Lacy) to be her boyfriend for the day. Mean while Charlotte's single sister Emma (Marisa Tomei) gets busted for shoplifting a tacky brooch. She is escorted in cuffs to jail by Officer Williams (Anthony Mackie) in what could be the longest ride ever. She manages to counsel the officer on his life choices. Filmed in Pittsburgh, PA, the quaint older wooden homes filled with light and hard wood floors looks comfy and cozy as snow falls outside. Sam and Charlotte have a good life and a beautifully appointed home that everyone would be glad to come back and hang out. As with most families, life tends to make people drift apart, communications become stilted and misunderstood as everyone is mired in their own self involvement. Charlotte just wants to have one last wonderful Christmas memory before Sam leaves her which of course is not going to happen because it's the movie plot. The actors all bring their competence to their roles, and the slapstick moments will bring smiles. We get it, families are dysfunctional, but in the end it's all we got. But in this ending it just feels like an leftover strewn dinner table and someone's gotta clean it up.